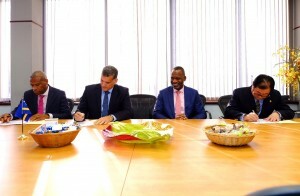 WILLEMSTAD - Curaçao Ports Authority (CPA), Kompania di Tou Kòrsou (KTK) and Guangdong Zhenrong Energy (GZE) signed a Memorandum of Understanding (MoU) on Thursday afternoon, in which parties expressed their intention to work together in different areas. In the MoU signed by the parties, CPA, KTK and GZE have agreed to exchange the necessary information to ensure that the services currently provided by CPA and KTK will also meet the required capacities from GZE. The agreement further stipulates that maritime operations and activities within the port are subject to current legislation and to the rules and conditions set by CPA. The government is in the process of reaching a final agreement with the Chinese company GZE on the operation of the refinery. The signing of the MoU took place at CPA's headquarters, in the presence of Minister Steven Martina of Economic Development and the VP of CPA, Irving Moeniralam. The MoU was signed by the representative of GZE, Bingyan Chen, the director of KTK, Suldric Rojer and the director of CPA, Humberto de Castro. Martina emphasized that the MoU is to create a positive framework so that all parties can combine the forces to maximize their contribution to the economy. “The investment and exploitation plans planned by GZE provide enough potential for all companies within the port to continue to grow,” said the Minister.